David's book, on which the talk is based, will be on sale. All sales profits go to the Thames Valley Air Ambulance. George Holt Thomas's family made their fortune from printing and publishing. His father, William Luson Thomas, founded and produced the Daily Graphic, the first daily illustrated newspaper. George lived locally at North Dean House, North Dean, Hughenden and at one time owned nearly all the land and properties in the village including the farms now owned by Beechdean Ice Creams. His legacy lives on there in the form of the village hall and two bungalows, buildings he arranged to be relocated from the military camp at Halton. He obtained the British Licence to build Farman aeroplanes but, unable to find a suitable manufacturer, he set up his own company, The Aircraft Manufacturing Company (usually abbreviated to AIRCO) to build them. In 1914 he employed Geoffrey de Havilland as his Chief Designer and so began the series of aeroplanes that carried the famous DH prefix. The designs from 1 to 26 all appeared during his employment at AIRCO and so should correctly be designated AIRCO DH 1 etc. Over the period of World War One Holt Thomas acquired existing or created new companies, including Gloucestershire Aircraft Company (later Gloster), Van Den Plas, Gnome & Le Rhone Engine Company, Airships Ltd. ,Integral Propeller Company, May Harden & May and Wycombe Aircraft Constructors. By 1918 he had created the world's largest aircraft company, building aeroplanes, airships, flying boats, aero-engines and propellers. In 1918 he was offered a knighthood, but declined it. In 1916 he founded one of the world's first airlines, Aircraft Transport & Travel (AT&T). In 1919 AT&T operated the world's very first international, daily, regular, scheduled air service, the true founding British airline, which was celebrated by British Airways in 2019 as a century of their company. He was a founder member of the SBAC (Society of British Aircraft Constructors). In 1919 he founded IATA (International Air Travel Association). When in 1920 he ended his involvement with the aircraft industry, he provided most of the finance to enable Geoffrey de Havilland to form his own company. In parallel he owned a record milk producing herd of cattle in North Dean. 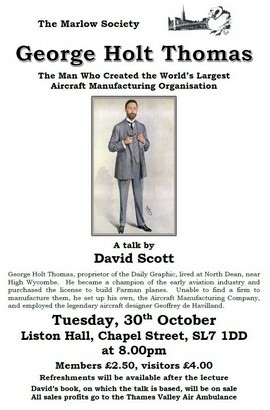 Having been influential in the formation of Imperial Airways in 1924, he died in Nice in 1929. Although a great publicist who had very influential friends he appears never to have been a great "self-publicist", keeping a low profile and allowing his employees and companies to flourish under their own names.